Toodlebunny and Dru's Design invite you to Trunk Show! Wine and other goodies will be served! This is the first annual Show celebrating local and Canadian inspired creations which will enhance every Moms’ life. 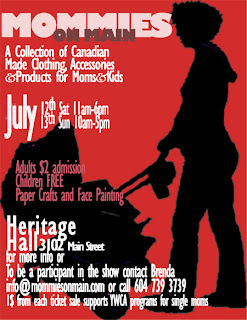 The show will feature numerous products/garments and accessories that are made by Moms or designed and made in Canada. Bring the whole family as there will be something for everyone. The show will be held on Saturday, July 12 and Sunday, July 13 at the beautiful Heritage Hall on Main Street (3102 Main at 15th Avenue) in Vancouver. The event runs from 11 am to 6pm on Saturday and 10am to 5pm on Sunday. sorry for the lack of posting lately!! got craft's website will be updated this weekend!! 2009 dates to be announced!! December's applications have been rolling in already, so if you are interested in coming out, please contact us! 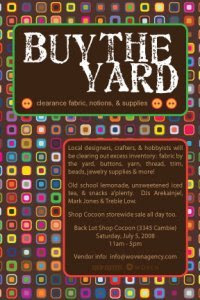 In the meantime, I hope to see you at buy the yard.